A HUMAN PERSPECTIVE Nineteenth-century fishermen along the Peruvian coast called the event El Niño—the Spanish name for the infant Jesus—because the event occurred near Christmastime. Every two to seven years, the waters off the Peruvian coast became warmer than usual, resulting in poor fishing. Eventually, 20th-century scientists studying worldwide climate changes confirmed the truth of this folk knowledge. They discovered that El Niño brought about changes in global weather patterns that disrupted not only fishing, but also other economic activities. Droughts and floods in Asia, Africa, and North America seemed to be related to El Niño. Scientists recognized that weather and climate conditions are not isolated but are connected parts of the global climate system. Four major factors influence the climate of a region: wind and ocean currents, latitude, elevation, and topography. Wind and ocean currents help distribute the sun’s heat from one part of the world to another through convection, the transfer of heat in the atmosphere by upward motion of the air. As sunlight heats the atmosphere, the air expands, creating a zone of low air pressure. Cooler dense air in a nearby high-pressure zone rushes into the low-pressure area, causing wind. Global wind patterns are caused by the same kind of circulation on a larger scale. The hot air flows toward the poles, and the cold air moves toward the equator. The winds would blow in straight lines, but since the earth rotates they are turned at an angle. In the Northern Hemisphere, they turn to the right. In the Southern Hemisphere, they turn to the left. This bending of the winds is called the Coriolis effect. The map to the right shows that the wind patterns are mirror images of each other in the Northern and Southern Hemispheres. Winds are identified by the direction from which they blow; a north wind blows from the north to the south. 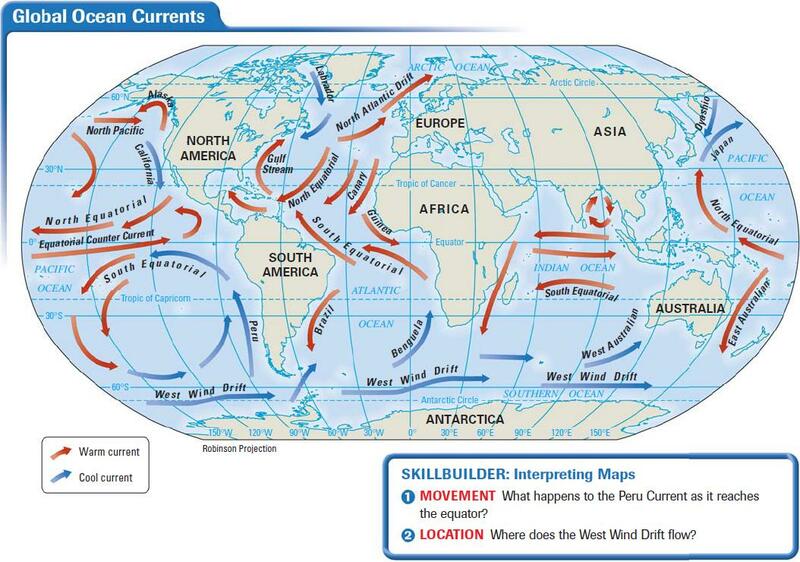 Ocean currents are like rivers flowing in the ocean. Moving in large circular systems, warm waters flow away from the equator toward the poles, and cold water flows back toward the equator. 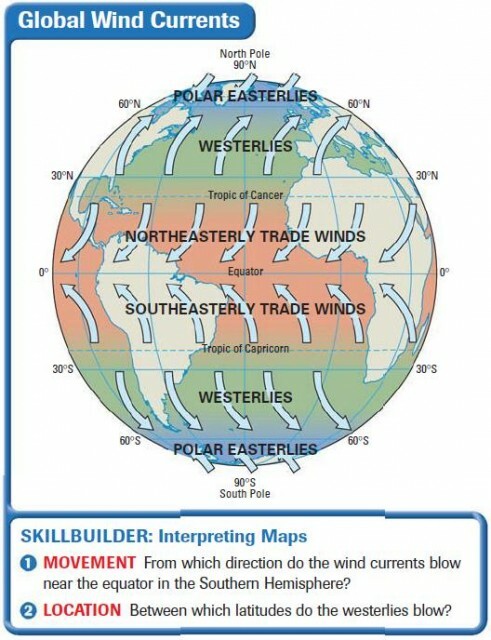 Winds blowing over the ocean currents affect the climate of the lands that the winds cross. For example, the warmth of the Gulf Stream and the North Atlantic Drift help keep the temperature of Europe moderate. Even though much of Europe is as far north as Canada, it enjoys a much milder climate than Canada. Ocean currents affect not only the temperature of an area, but also the amount of precipitation received. Cold ocean currents flowing along a coastal region chill the air and sometimes prevent warm air and the moisture it holds from falling to earth. The Atacama Desert in South America and the Namib Desert in Africa, for example, were formed partly because of cold ocean currents nearby. 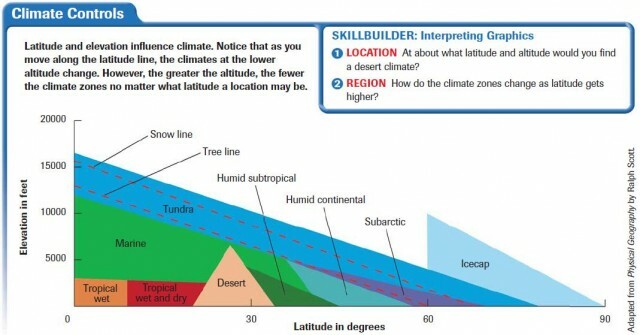 Geographers divide the earth into three general zones of latitude: low or tropical, middle or temperate, and high or polar. Tropical zones are found on either side of the equator. They extend to the tropic of Cancer in the Northern Hemisphere and the tropic of Capricorn in the Southern Hemisphere. Lands in tropical zones are hot all year long. In some areas, a shift in wind patterns causes variations in the seasons. For example, Tanzania experiences both a rainy season and a dry season as Indian Ocean winds blow in or away from the land. The high-latitude polar zones, which encircle the North Pole and South Pole, are cold all year. Summer temperatures in the polar regions may reach a high of only 50°F. The earth’s two temperate zones lie at the middle latitudes, between the tropics and the polar regions. Within the temperate zones, climates can vary greatly, ranging from relatively hot to relatively cold. These variations occur because solar heating is greater in the summer than in the winter. So summers are much warmer. Another factor in determining the climate of a region is elevation, or distance above sea level. You would think that the closer you get to the sun, the hotter it would become. But as altitude increases, the air temperature drops about 3.5°F for every 1,000 feet. Therefore, the climate gets colder as you climb a mountain or other elevated location. Climates above 12,000 feet become like those in Arctic areas—with snow and ice. For example, Mt. Kilimanjaro in east Africa is capped by snow all year long. The diagram above will help you see how latitude and elevation are related. Landforms also affect the climate. This is especially true of mountain areas. Remember that moisture-laden winds cool as they move up the side of a mountain, eventually releasing rain or snow. By the time the winds reach the other side of the mountain, they are dry and become warmer as they flow down the mountain. Climates change over time. Scientists studying ice-core samples from thousands of years ago have noted a variety of changes in temperature and precipitation. Some of the changes in climate appear to be natural while others are the result of human activities. The warming of the waters off the west coast of South America—known as El Niño—is a natural change in the climate. About every two to seven years, prevailing easterly winds that blow over the central Pacific Ocean slow or reverse direction, changing the ocean temperature and affecting the weather worldwide. Normally, these easterlies bring seasonal rains and push warm ocean water toward Asia and Australia. In El Niño years, however, the winds push warm water and heavy rains toward the Americas. This can cause floods and mudslides there, while Australia and Asia experience drought conditions. When the reverse occurs—that is, when the winds blow the warmer water to the lands on the western Pacific rim—the event is called La Niña. La Niña causes increases in precipitation in places such as India and increased dryness along the Pacific coasts of the Americas. Although controversy exists over the causes of global warming, scientists agree that air temperatures are increasing. Since the late 1800s, the temperature of the earth has increased by one degree. However, estimates for the next century suggest that the increase will be almost 3.5 degrees. Some scientists believe that this warming is part of the earth’s natural warming and cooling cycles. For example, 18,000 to 20,000 years ago, the earth was in the last of several ice ages, when vast glaciers advanced over huge portions of the land mass. Other scientists argue that global temperature increases are caused by the greenhouse effect. The layer of gases released by the burning of coal and petroleum traps some solar energy, causing higher temperatures in the same way that a greenhouse traps solar energy. As more and more nations become industrialized, the amount of greenhouse gases will also increase. Scientists predict that, if global warming continues, ice caps will melt, flooding some coastal areas, covering islands, and changing the global climate. In the next section, you will learn about world climate regions.